I absolutely love sea bass. Only, I seem to forget that it exists and we’ll have months without it. Which really is a shame, because it is quick to cook, so light and seriously nicer than cod. We have salmon steaks on repeat order from the supermarket. Smoked salmon is our scrambled eggs’ best friend. And I seem to eat smoked mackerel all the time. Slap it on a plate, add a bit of salad, there’s lunch. Sea bass, it’s got to change! No thinking. Get mackerel. Eat. So far, so practical. But that is lunch for one. No frills, make your tummy happy, get energy, continue your day. There’s time for mackerel. And there’s time for sea bass. 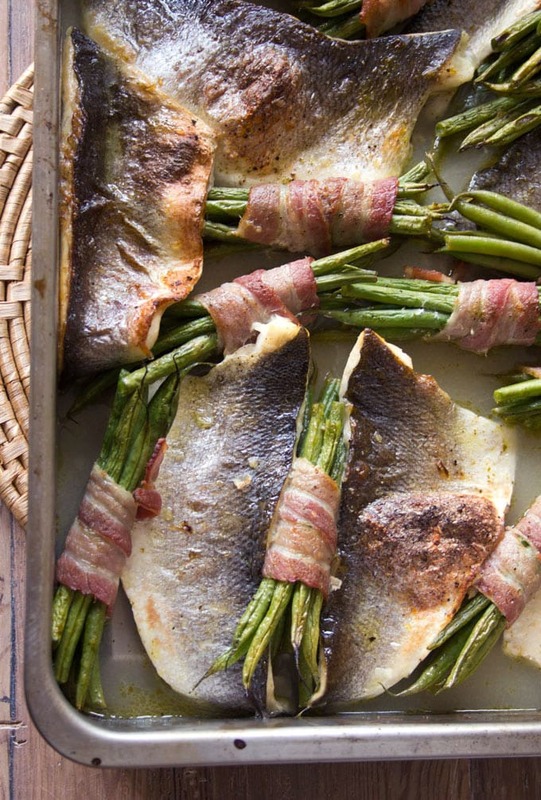 Just look at this roast sea bass traybake. It’s not just me, is it? This dish makes me want to applaud! Of course, you could just scatter all the ingredients in the pan and save yourself some time. But these little bean parcels are pushing all the right buttons for me. Thin green asparagus also works really well here, by the way. And hand on heart, wrapping the bacon only takes five minutes. 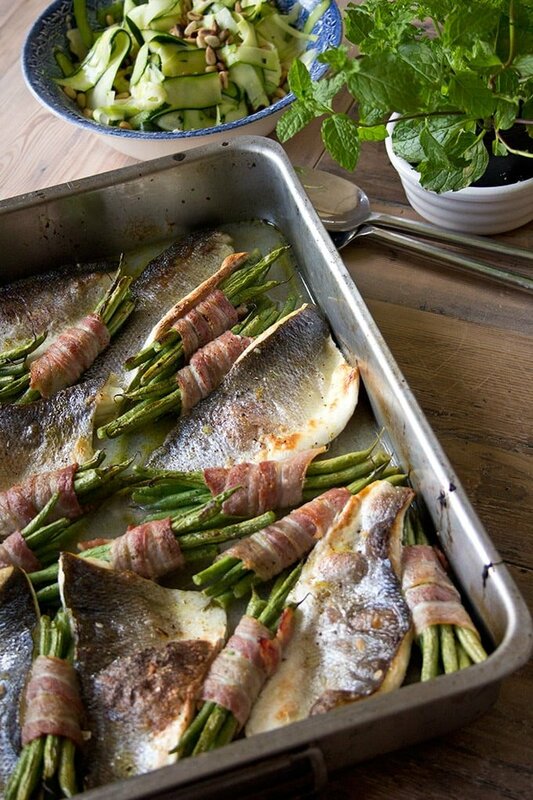 In essence, roast sea bass traybake is a dish full of flavour that’s super simple to put together. The secret is a mint and olive oil marinade that mixes with the white wine and creates the most fragrant sauce. Combined with the saltiness of the bacon it becomes the perfect canvas for the delicate taste of the sea bass. You could serve it with some wholegrain rice or quinoa to soak up the sauce. Or you stay low carb and have it with a veggie side such as the zucchini and roasted pine nut salad in the picture. No fancy machines necessary to get the zucchini strips by the way, I did them with the potato peeler. I have made this dish for various summer dinner parties over the years. But you know what? Today, I had it for lunch. I’d run out of mackerel. Preheat your oven to 240 degrees Celsius. Marinate the sea bass fillets in a glug of oil, lemon zest and juice of 1 1/2 lemons for 10 minutes. If your beans are quite thick, boil them for 2 minutes. Thin ones can be used raw. Toss the beans in the minty lemon dressing in the tray, then divide them into parcels and wrap with bacon. Pour the wine or stock into the tray and arrange the fish fillets skin side up around the parcels. 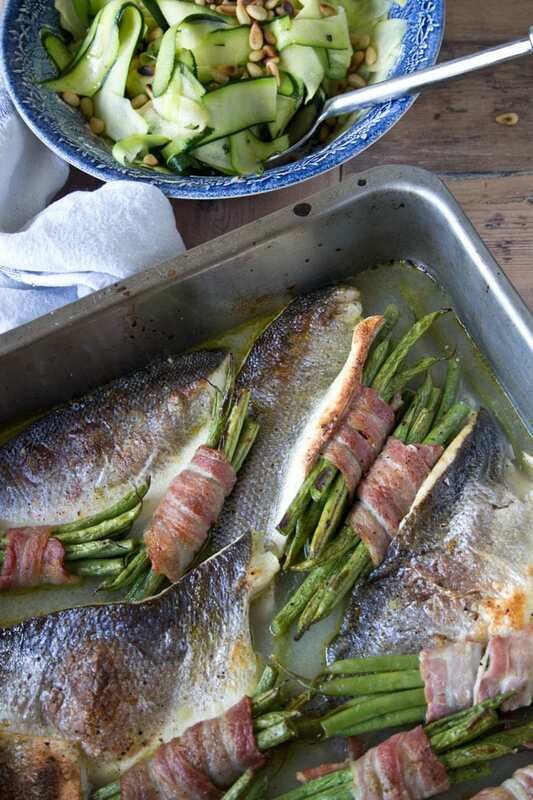 Scatter over the butter pieces, season with salt and pepper and roast in the oven for ca 12 minutes or until the fish and the bacon are golden and crispy. We made this for lunch and enjoyed it very much. It was a great reminder that we love fish and should make it more often!